When I did a rotation in my pantry last week I also found a jar of barley that hasn't been used in a few months. To pay my respect to this grain (I always feel guilty when I abandon some of my grains for more than two months) I made a very simple but aromatic and full of flavor soup. With just a handful of dried porcini mushrooms, half a cup of barley and an onion my dinner was ready in less then an hour. First, you need to pre-soak dried porcini for about 15-20 minutes. I usually wash any dried mushroom first from any debris, and after that I place mushrooms in a bawl and cover it with about 1 liter (1 qt) of cold water. Then I prepare all other ingredients: chop the onion, wash the barley. Next, heat a tablespoon of olive oil in the cast iron dutch oven or a stainless still pot. Add the onion and stir, sprinkle with a little salt and stir again. Fish the mushroom from the bawl and reserve the soaking water (It should have a reach amber color). Chop the mushrooms and add to the onions. Stir a few times and add water from the mushrooms. To make sure there are no debris, I run soaking water through coffee filter placed inside the strainer. Bring it to the boil, reduce the heat to a medium and cook until barley is done (about 30-35 minutes). Season with salt, dried dill (optional) and serve with toasted bread (I made rosemary-garlic crostini from homemade rye bread). Can you smell it?! I thought I made enough soup for us to have for dinner and for the next day's lunch. Silly me, thinking I would have some leftover! I could only hear crunch-slurp-crunch-slurp... until all soup was gone. We loved it, and to our surprise, the Teenager even made a comment, that we should have this soup more often! How often do you use your grains? What grains do live in your pantry? Yum this looks so good... even though it's super hot out right now this soup is exactly what I'm craving! Mushrooms and barley are such a fantastic combination. You know,when it's hot I eat hot soup and drink hot tea, it helps me to stay cool! Funny, ha?! Thank you Lizzy. Yes, short ribs would be good, smoked short ribs. What a great combo porcini and barley. I do barley soups too. It is a very refreshing cereal and very healthy. Yes, this two ingredients are "married" to each other! What beautiful photos, this looks wonderful. I have barley in my cupboard right now that is a couple of months old. This soup has inspired me to use it up. Thanks! Grains have a long shelf life, that's what I like about them. And they can be sprouted and then become a "vegetables"! How delightfully warming and delicious combination! Thank you! It's good with pickles too! Dill yum! Unfortunately, I can't eat barley, but I think I have all those ingredients in my pantry! My favorite grain (if you count it a grain) is quinoa, love the stuff!! This soup can be made with buckwheat, would taste just as good, and buckwheat is gluten free. Answers, very often and my hubby don't live them in the pantry to long, he eats grains almost every day, jajajajaja, But my poor and yummi rice has to wait 2 month to be cook when hubby is here. What a delicious soup Marina. Your husband is very good to himself: grains are healthy! Thanks Maureen! I am glad you like it! Ooh I'm loving the soup recipes-it's raining outside and all I want is a big bowl of soup! Do you put pickles in your sometimes? That soup looks good and you have presented it so well. I am not that much of a grain person other than for chick pea and green grams. Thank you. Do you eat rice? Hi Marina! Thanks for confirming my quilt pattern! Your soup looks yummy! We eat a lot of wild rice here. Nothing like a tasty soup! I don't think I've tried wild rice yet. I shell give it a try. Thanks for visiting me, Jacqueline! New reader here. First of all, your soup looks lovely - I like that you used dried mushrooms. These a re a pantry staple for me that sometimes get overlooked like my grains so I really appreciate the combination of the two. The grains in my pantry at the moment are barley, quinoia, and couscous. Thanks Lyndsay! I use dried mushrooms quite often, even when I cook with the fresh ones I add a little of dried for a flavor. 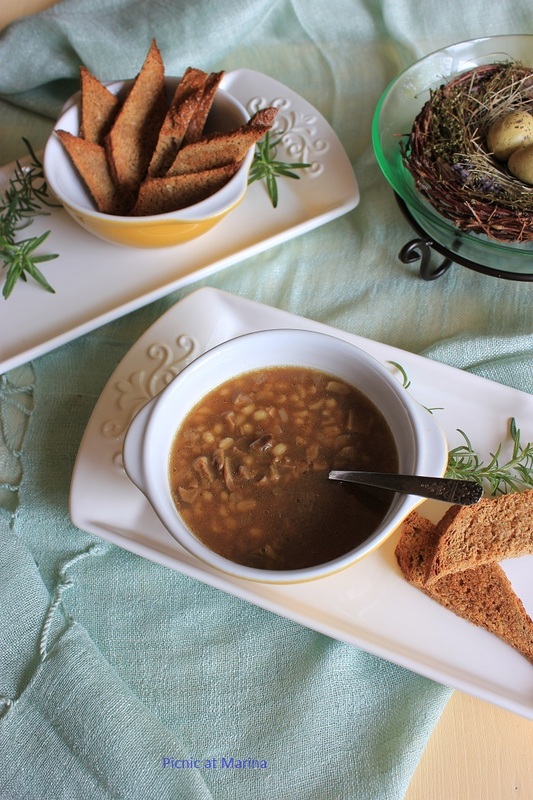 The soups I remember from my childhood were always full of barley. i really enjoy eating it, especially in soup. I love barley in soups too, especially the next day (if I am lucky): it absorbs flavor and tastes great! That soup looks so so yummy! I'm sure it tasted amazing, a compliment from a teenager is no small thing! You are so right about the Teenager! Thank Sriya! I am heading over now! Your soup looks delicious and in fact, is one of my favorite soups. My recipe is similar to yours and I know why your teen thought it was great. Usually on hand in the pantry is barley, brown rice, steel-cut oats, cornmeal, wheat berries, popcorn, etc. Thank you Pam! What do you do with wheat berries? Flour? Wheat grass? WOW! This sounds so flavorful and delicious!! YUM! Thank you Marina for stop bye in my cooking blog. I use Whole Wheat Soft Flour Tortilla for Burritos o Quesadilla. Thanks Olguis! I need to find a recipe for homemade Tortilla on your blog. WOW! Awesome. I love cooking with mushrooms because they have such a wonderful aroma and meaty flavor! Making this soup soon! Yes, they do have great aroma, especially wild ones. I think it's one of my favorite smells in the kitchen: mushrooms! Bet that soup freezes well. Yes, I am a lazy cook and always looking for items that freeze well, why make a single recipe when doubling or tripling takes about the same amount of time with extra for the freezer. I am sure it does freeze well, although I've never done it. I usually freeze stock, or vegetables (shredded carrots or shredded beets) to use in cooking. That speeds up the process. But I rarely freeze a meal. We usually eat leftover in one or two days. 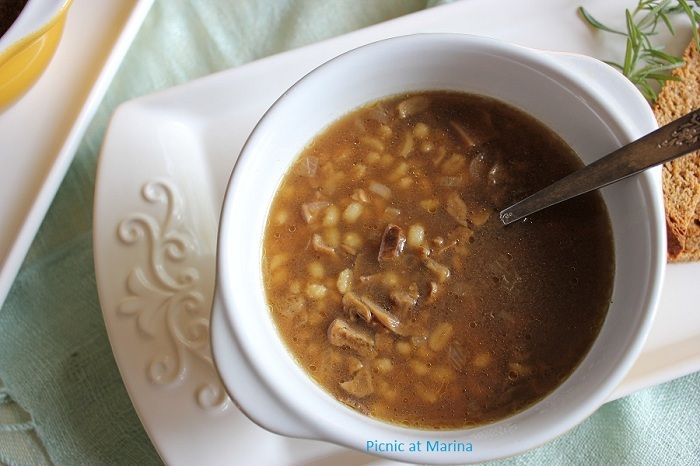 I have recently discovered barley soup and am loving every bit of it..Can't wait to try making this porcini mushroom and barley soup, and I am sure it will be a hit with my family too.. Thanks for stopping over and do stay in touch. I will be back hungry for more ;p.. Cheers!! What a great soup; Love grains but do not cook with them as much as I should. Very good suggestion to make a list.